The death toll at the Rana Plaza building has reached 665 as of Monday morning U.S. Eastern Time. To date, less than 50 percent of the rubble from the collapsed building has been removed—meaning that many more bodies are likely to be recovered. The stench of death is everywhere. Many bodies are decomposed beyond recognition and workers are being identified through their ID cards and clothing. The Bangladesh Garment Manufacturers and Exporters Association (BGMEA) is now admitting they did not have a comprehensive list of the workers in the five factories housed in the Rana Plaza building. Now, no one knows how many workers were in the building when it collapsed. “It is because of the ugly greed of the owners who forced us to work on April 24, forcing us into death at Rana Plaza. We demand justice as so many lives have been lost and so many others seriously injured and maimed. I wish it never happens again! 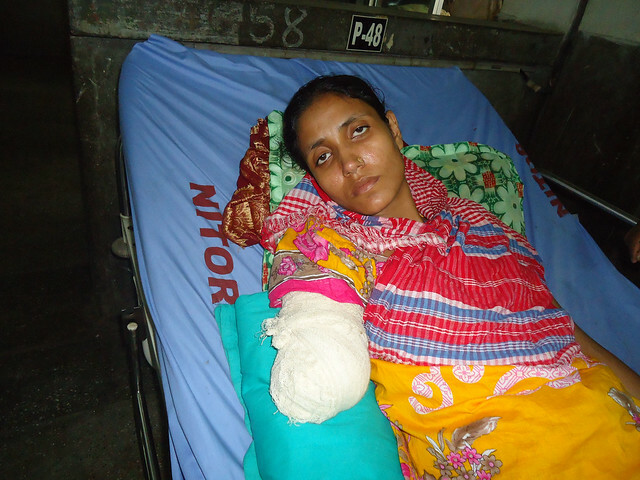 “I worked as a sewing operator for three years at the New Wave Style factoryon the 7th floor of the Rana Plaza building. The building had developed cracks and we were scared that it might break apart. But we were forced to enter the factory as they [management] threatened to withhold our wages [for the full month] if we didn’t work that day. Just after an hour, the factory caved in with a loud bang. It collapsed as heavy generators shook the floor. I was sitting on a stool sewing the garments. In a few seconds everything broke apart and my sewing machine fell on my right arm. Immediately a big slab from a concrete pillar fell on the machine and my arm. My right arm was crushed and trapped between the sewing machine and the concrete pillar. I tried to pull my arm out but I couldn’t. It was dark inside. Many of my co-workers were also trapped and screaming out, calling for Allah to save our lives. I had no idea where I was after the collapse. “The rescue team pulled me out of the ruins at 8:30 a.m. on April 25, after spending 24 hours in a living grave. The medical team took me to the Combined Military Hospital at Savar. The doctor amputated my right arm at 8:30 p.m. on April 25. I was in a great deal of pain. I was shifted to the orthopedic hospital on that same day due to complications. I have been at the hospital since then. I still have pain where the concrete pillar hit me. “It is clear that I will not be able to lead a normal life. How will I be able to bring up my kids? How will I buy food for them? How will they go to school? My daughter is in the third grade and my son in nursery school. They will have to stop their education as I won’t be able to afford to send them to school.